This is the Siq, a word that means ‘shaft’ in Arabic. It’s the natural gateway to one of the world’s most spectacular landmarks, the ancient carved-stone city of Petra, a World Heritage Site that was once the capital of the Nabataean Kingdom around 300BC. As you wind your way along its kilometre-long twisting path, which narrows to just three metres across in places, eventually the city’s impressive 40-metre tall structure known as The Treasury, carved into red cliffs, comes into view. It’s a journey that every intrepid traveller should make. Welcome to nature’s most spectacular hallway, carved out of ancient stone, forming a three-kilometre path that promises a walk to remember. This is the Siq, a word that means ‘shaft’ in Arabic. 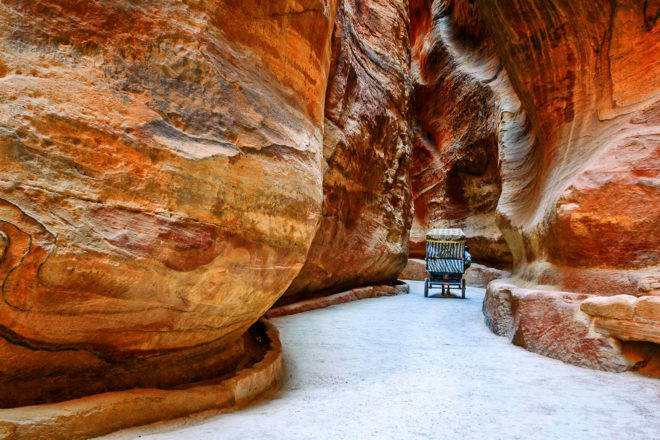 It’s the natural gateway to one of the world’s most spectacular landmarks, the ancient carved-stone city of Petra, a World Heritage Site that was once the capital of the Nabataean Kingdom around 300BC. As you wind your way along its kilometre-long twisting path, which narrows to just three metres across in places, eventually the city’s impressive 40-metre tall structure known as The Treasury, carved into red cliffs, comes into view. It’s a journey that every intrepid traveller should make.